Mandizha earns IM Norm at NY Int’l! Farai Mandizha has been on the U.S. tournament circuit a few years and has developed a reputation on the east coast. The New York-based player from Zimbabwe is perhaps known for his acute skills in blitz, but he has been putting together some solid results in major tournaments. Having a Hikaru Nakamura scalp on his resume and one IM norm under his belt, Mandizha set forth to compete in the New York International. He scored well in the Chicago Open, but was out of norm contention. The New York International was the site for many strong players including a contingent from India. In fact, Mandizha would face the top seed in GM Surya Ganguly. In total, he would play seven Grandmasters and was in contention for a GM norm until the end. He would lose to GM Robert Hess, but would secure a second IM norm with a round to spare. 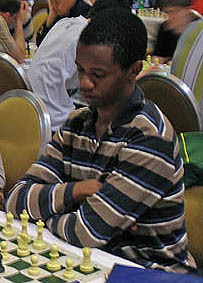 Mandizha put himself on good pace by beating GM Alexander Shabalov and Ganguly in succession. He then tried to beat Ehlvest with black, but was unable to keep the momentum and loss. However it is this type of determination that is needed to reach the next level. Mandizha could not recreate his magic in the next three rounds getting three straight draws. While he had already clinched an IM norm, he was forced to get a win against an 18-year rising star in Hess. This proved to be too high of a barrier and he would have to walk away with only the IM norm. Good job Farai Mandizha, for your excellent results at the NewYork International. You are the next in line to become a Grandmaster from the mother land. Keep up the good work! You and I played a blitz game at the Chicago open this year 2010. I’m the black expert from Chicago Illinois. That’s where I met you for the first time. My name is Isaac M. Braswell a.k.a. “Bigbrothaike”. I’ll be keeping tallies on you and your perfomances and know without a doubt you will be playing to your best abilities. Good luck on your adventures and your triumphs! Thanks for calling me yesterday as you always do, I appreciate this. It shows that you never will forget where it all began, and your roots! PS: Take the latest advice I gave you seriously! GOOD LUCK, I AM PROUD OF YOU ALWAYS! Farai Mandizha earned his 3rd and final norm at the Philadelphia International. He will now look to have his title conferred after getting his rating to 2400 FIDE. Well done Farai keep it up!